This vegan lentil loaf has a robust bean (lentil) flavor with seasonings that complement it. It doesn’t fall apart, isn’t too mushy or too dry, and doesn’t lack textural variety. It’s perfect for entertaining over the holidays, or to enjoy for a weeknight dinner. Even if you are experienced in the kitchen, there are always a few recipes that can throw you off your game. Developing recipes is tough work. Seriously. I know eating delicious food all day, playing with interesting ingredients, and developing new recipes sounds like fun, but it can really test your patience, especially when it’s a particularly challenging recipe. Often times the challenges stem from trying to make a specific dish a little healthier or working with strict ingredient guidelines – as is the case with this lentil loaf recipe. I made about 27 versions of this recipe over the course of a few months. It was extremely challenging to create a lentil loaf that was both vegan and gluten-free. A lentil loaf that had a satisfying, robust flavor, and the right texture. A lentil loaf that even devout carnivores would love. So what’s the secret to a vegan lentil walnut loaf that has a textural variation and nuance to match its great flavor? I had to cook my way through a few dozen to figure it out. The downfall of many lentil loaf recipes is the mush factor. Most of the elements that often go into a homemade lentil loaf (lentils, mushrooms, vegetables) are high in moisture, which can lead to a mushy texture. Another problem with a lentil loaf (or even veggie burgers) is that all the ingredients have already been cooked. This means that the proteins and starches no longer cling together and don’t really change shape when you cook them for a second time. Have you ever noticed how a veggie burger doesn’t shrink on the grill the way a meat burger does? So, you need to build texture into the loaf right from the start. I ran through the usual gamut of add-ins: cooked grains, pseudo-grains, as well as nuts and seeds. I settled on walnuts (pecans or cashews would work just as well). In a moist environment, walnuts soften up and offer just a bit of pleasing resistance to each bite. Walnuts have flavor that is also mild enough to not distract from the savory flavor of seasoned lentils and vegetables. Talking about lentils, brown or green lentils really are the best legume for this vegan loaf. They are not too mushy when cooked (like yellow or red lentils) but still break down a little bit (not like French lentils). They are also not as pasty as beans or peas. The aromatics, vegetables, and mushrooms are the flavor enhancers. They also provide moisture, so the lentil loaf doesn’t turn out too dry and crumbly. The binders in this recipe are pretty straightforward – flaxseed meal and breadcrumbs. I have experimented with chia seeds and psyllium, but didn’t like the texture. Breadcrumbs and flaxseed meal do a great job at bridging the gap between liquids and solids by capturing the moisture and transforming it into a binder. It might be an extra step, but you really want to sauté all the vegetables, and mushrooms before using them in the lentil loaf. Sautéing helps to eliminate the vegetables water content and condense their flavor. Another benefit of cooking the vegetables is that you can season them to make them even more flavorful. Preparing the lentils is the trickiest part. If you’re using dried lentils, cook them to the point that they’re just done – still firm and not falling apart. This way, the lentils add a creamy texture without turning mushy. The degree to which you process the lentils after they have been cooked is really important. If you don’t mash the lentils enough, your loaf will fall apart. If you mash the lentils too much, the lentil loaf will be too mushy, having a paste-like texture. I prefer to mash them well, yet leaving about 3/4 of the lentils only partially mashed. Since all the ingredients in the loaf are cooked, taste the mixture before transferring it into a loaf pan. This is the time you can add an additional seasoning. Once baked, let the lentil loaf rest in the pan for at least 15 minutes. This is really important because the loaf firms up as it cools. If you remove the loaf from the pan straight out of the oven (when it’s still hot), it might not retain its shape. 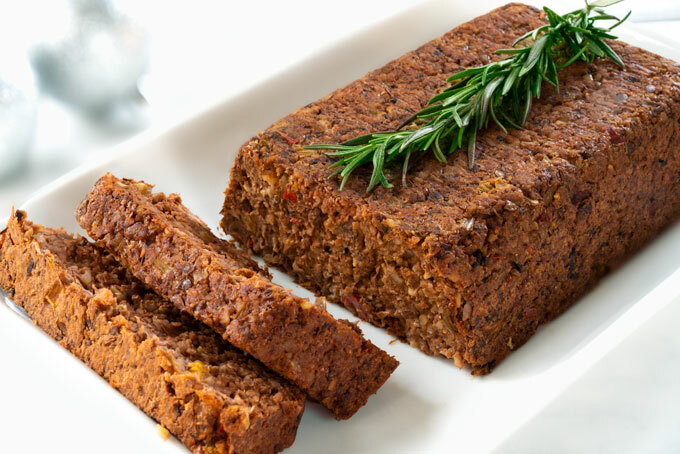 This vegan lentil loaf has a robust bean (lentil) flavor with seasonings that complement it. It doesn't fall apart, isn't too mushy or too dry, and doesn't lack textural variety. It's perfect for entertaining over the holidays, or to enjoy for a weeknight dinner. Add the lentils into a medium saucepan, cover them with water, and bring to a boil over high heat. Reduce the heat to a simmer, season with salt, and cook the lentils until tender, 20-30 minutes. Heat the olive in a pan over medium heat. Add the onions and garlic, and saute them until translucent, 5-7 minutes. Add the mushrooms, followed by a pinch of sea salt, and saute the mushrooms until they have softened and reduced in size, about 5 minutes. Then add the celery, bell pepper, and thyme. Cook for 2-3 minutes. Add the walnuts into a food processor and pulse a few times until a loose meal forms. Add the lentils and mushroom-vegetable mixture, and pulse to combine. Be careful not to purée the mixture. Add the flaxseed meal, tomato paste, marjoram, salt, and black pepper. Stir until a loose dough forms. Add the breadcrumbs in stages, until a thick dough forms. If the mixture is too wet, add more breadcrumbs. If it's too dry, pulse it a little more. Transfer the mixture to a parchment-lined loaf pan, spread, and press into an even layer. Brush the top with a little oil to help the loaf retain moisture. Bake at 350°F/175°C uncovered for 30-35 minutes or until golden brown on the edges and slightly dry to the touch. Remove from oven and let rest for 15-20 minutes in the pan. Then gently remove and carefully slice and serve. Store leftover lentil loaf, covered, in the refrigerator for 4-5 days. For longer term storage, freeze in an air-tight container for 1 month. *2/3 cup uncooked brown lentils is ~ 2 cups cooked. *Soak the lentils in cold water for a few hours so they soften up and are easier to digest. When the lentils are soaked, drain the water, rinse the lentils thoroughly, and use as instructed. **The amount of breadcrumbs depends on how moist/dry your lentils are. I used just shy of 1/2 cup. Thank you for another exciting and different récipe! Will definitely give’t a try. Just made this recipe and it is extremely delicious! Half the quantity serves two adults. Will make it for Xmas and serve with Davidson’s Plum jam. Hi First of all, amazing recipe!! Especially as a vegetarian it works Kind of like a meat Substitute for me so thank you! I was Wondering if you could share the amounts in grams. They don’t sell Cups in italy so just to be exact i’d love to know! Thank you, Petra for this recipe. I changed mushrooms with corn from the can, flaxseed meal with wholewheat flour and breadcrumbs with polenta. Texture and flavours are great! Looking forward to prepare thus loaf with mushrooms. Thanks again, Petra! Petra your lentil meatloaf was awesome. Petra, your videos are beautifully simple. Beauty in the simplicity. They are even soothing. The result is a very effective presentation that gets right to the point in a calm manner. Nice camera work, too. A pleasure to watch. Thank you so much, Robert! I really appreciate the kind and encouraging words. Delicious, thank you. I used oats instead of breadcrumbs and carrots instead of bell pepper. Turned out great! I was wondering if you might share your gravy recipe and mashed potatoes recipe, that went with the meatloaf? Hi Erika – thank you for your comment. I am currently working on a cookbook with dinner recipes, and the gravy and mashed potatoes are part of the cookbook. So, I probably won’t be sharing those recipes on my blog. Thank you for your understanding. Wow, this is amazing!! so tasty!! Thank you so much for the wonderful feedback, Elzina! ❤️ So happy you enjoyed the recipe!